The Bangladeshi community have made a valuable contribution to life in Britain since their migration to these shores in the 1950s. From the world of politics and business to the media and sports, British Bangladeshis have made their mark in society. 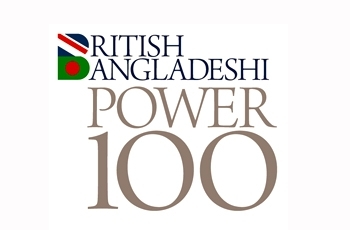 Today sees the launch of the British Bangladeshi Power 100 list at Portcullis House, London. The list represents 100 people, according to co-founders Abdal Ullah and Ayesha Qureshi MBE, whose ideas, example, talent, success or discoveries influence or positively highlight the British Bangladeshi community or have helped improve the world that we live in. The list has been broken down into 10 categories covering business, catering, education, community and voluntary organisations, media, politics and as well as the women who have made a mark. Each category has 10 positions which are listed in rank order. The rankings have been determined by an advisory committee of leading Bangladeshi UK based newspaper editors headed by chief advisor, Mohammed Nobab Uddin, Editor, Janomot Bengali Newsweekly, the oldest ethnic newspaper. The list has also been consulted on widely amongst a selected group of leading figures in the community. “There is a small representation of British Bangladeshis in business and also local government politics, including nationally within the major political parties. But I must say that the Bangladeshi community is growing rapidly in the UK, and both third and fourth generation British Bangladeshis are contributing significantly in various sectors and professions." As the community continues to grow, the publishers of the BBL100 list believe it islong overdue and now is the time to praise the achievement and share this with the Bangladeshi community living in the UK and around world and the wider British public. Submitted by Abdul Khaled (not verified) on Wed, 25/01/2012 - 15:40. You state that the list was compiled by leading Bangladeshi newspapers, yet only Mr Uddin is mentioned from Janomot, so how influential can this list be?